The 173-acre Hardman Farm is located in historic Sautee Nacoochee, just south of Helen, Georgia. It is best recognized by a gazebo-topped Indian mound and cow pasture. 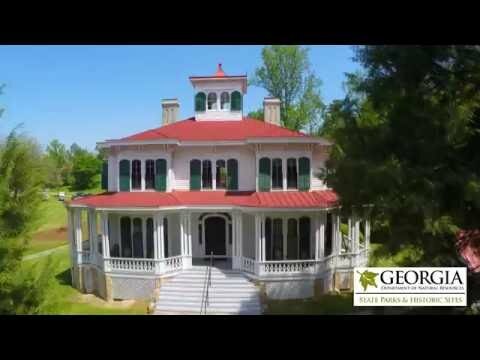 The house, built in 1870 by Captain James Nichols, is a grand example of Italianate architecture and was originally known as "West End" because it was at the west end of the Nacoochee valley. Visitors will enjoy seeing the house, its 19th-century parlor and large dairy barn. The last owner was the family of Dr. Lamartine Hardman who was Governor of Georgia from 1927-1931. The Nacoochee Indian Mound is a burial site and was probably used long before the Cherokee inhabited the area. The Indian Mound with its little gazebo is one of the most recognized landmarks in Georgia. Call 706-878-1077 to confirm hours and admission fees. Open March through December. Hardman Farm is open Thursday - Sunday, March through December. Guided tours are hourly: 10 a.m. - 3 p.m. (Reservations suggested for groups).